Interrogating the Invisible is a project of the Federal Bureau of Information (FBI) of the District of Leistavia. The FBI was formed in order to collate the statistics for the constitution of Leistavia voting. 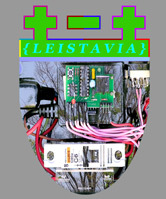 Leistavia was constituted as a project for the 12th ISEA in Helsinki and Tallinn in 2004. The use of the word invisible in the title of this project ofr ISEA 2006, is a reference to the invisibility of certain cultural groupings. For example, at ethnic festivals, many cultures celebrate their traditional roots. These traditions are celebrated by the wearing of traditional costumes and the performance of traditional dance and song. Traditional culture is highly visible on such occasions. In contrast, hybrid cultures, which have cultural influences but often no fixed traditions of dance, song and costume are not easily distinguishable. If a person has New Zealand Maori and Scottish ancestry, or Mexican and Vietnamese for example, what sort of clothing or song is appropriate at ethnic festivals? On the one hand this is a difficult question but on the other, surely people with these cultural identifications exist, and are even proud of their heritage. One aim of this project is to give people with multiple cultural identifications visibility. The works exhibited in San Jose directly examine the issue: what is the difference between those indicating one cultural identification and those indicating two? One answer is given by the still images presented in San Jose. An animation formatted for DVD has been created which shows the individual responses of participants, and provides a unique sequence of portraits of the cultural identification beliefs of those taking part.